Andreas Rupprecht: "Nuevos avances en 2017 para el programa de portaviones"
Andreas Rupprecht, autor de varios libros sobre aviación china y participante habitual en numerosos foros de esta temática, ha publicado un artículo en Sputnik titulado: Chinese Aircraft Carrier Program to Make New Advances in 2017. The progress of China’s aircraft carrier program continues to move forward into the new year after achieving a number of milestones in 2016. In November 2016 the Soviet-era Liaoning, Beijing’s only carrier, was declared “combat ready” by political commissar Senior Capt. Li Dongyou. Following the declaration, the ship departed on a training voyage that featured a stop on the edge of the South China Sea, at the People’s Liberation Army Navy’s (PLAN) base on Hainan Island. Several PLAN corvettes, frigates and destroyers accompanied the Liaoning, which was carrying Changhe Z-18 and Harbin Z-9 helicopters, along with more than a dozen Shenyang J-15 Flying Shark carrier-borne fighters. China’s second carrier, currently called the 001A, is being built at the same Dalian shipyard that renovated the Liaoning. 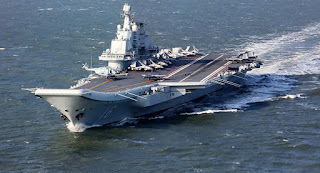 The new carrier differs from the Liaoning, with its revised flight deck arrangement and other features, but retains the ski-jump bow used for launching aircraft. The ship is expected to be launched in late 2017, and recent satellite photos of Plan’s Hulado air base show that the runway replicas constructed for pilots to practice landings underwent modifications between June and October 2016. According to China defense experts, this was done possibly to reflect differences in the new ship’s flight deck. Images recently surfaced on Chinese social media platforms suggesting that Beijing may be developing a carrier with Catapult Assisted Take-Off But Arrested Recovery (CATOBAR), that can accommodate carrier onboard delivery (COD) aircraft, AEW and other large aircraft. This is plausible given the limitations of the arrested recovery (STOBAR) launching method, which limits the payload and range of shipborne aircraft. According to the The Centre for Research on Globalization (CRG) website, "A CATOBAR equipped CV-18 will gain the advantages of greater range and weapons load-out for its strike wing. It will also allow for the use of fixed-wing anti-submarine (ASW) aircraft and tactical airborne early warning (AEW) aircraft. The PLAN’s current reliance on helicopter borne ASW and AEW is a shortcoming that must be resolved." Author Andreas Rupprecht, who has written books on Chinese military aviation and its aircraft industry, told Defense News that in 2017 there will likely be "more lengthy and intense exercises by the Liaoning and J-15s, as well as the likelihood that we will see a second J-15 regiment established with aircraft from the third production batch." 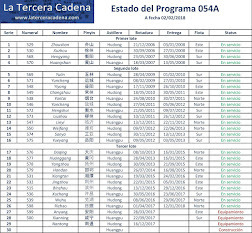 El artículo condensa las últimas noticias acerca del estado del programa de portaviones, sin nada particularmente novedoso, pero es un buen punto y seguido. 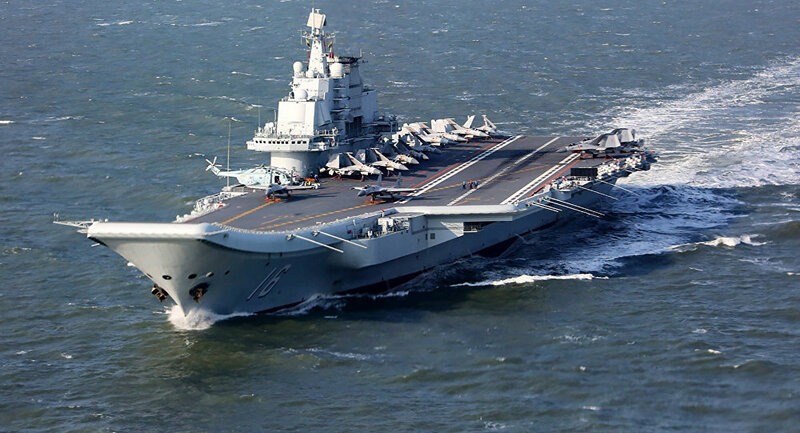 China’s second aircraft carrier is “taking shape” after two years and nine months of construction, local media reported, a move likely to further unnerve Taiwan and other neighbors about Beijing’s growing military assertiveness. Construction of The Shandong, named after a province in China’s east coast, began in 2014, the APP of Shandong television and radio said in a report seen on Tuesday. The Shandong, China’s first indigenous aircraft carrier, is “taking shape”, the report said. It did not give a date for completion or further details. It was being built in the northeastern port of Dalian, the Defense Ministry has said. The country’s first aircraft carrier, The Liaoning, was bought from Ukraine in 1998 and refitted in China. In January 2017 a group of Chinese warships, led by The Liaoning, tested weapons and equipment in the South China Sea in what the Chinese Foreign Ministry described as routine exercises that comply with international law. The group of warships sailed through waters south of Japan and then rounded east and south of Taiwan in December on their way to the southern Chinese province of Hainan. But China is years away from perfecting carrier operations similar to those the United States has practised for decades. The eventual launch of The Shandong would further rattle self-ruled democratic Taiwan, which Beijing claims as its own, as well as Asian neighbors Brunei, Malaysia, the Philippines, Taiwan and Vietnam with disputed claims in the South China Sea. China and Taiwan have been diplomatic and military rivals since 1949 when Nationalist, or Kuomintang, troops lost the Chinese civil war to the Communists on the mainland and fled to the island. Bilateral trade, investment and tourism have grown significantly in the past three decades, but tensions have been simmering since the island elected President Tsai Ing-wen from the independence-leaning Democratic Progressive Party last year. China has vowed to attack if the island declared de jure independence.